Drawing is the foundation of most picture making and it’s a skill that requires regular practice and study. I’m determined to improve my drawing skills and the Every Day in May drawing challenge came at just the right time to inspire this daily practice. 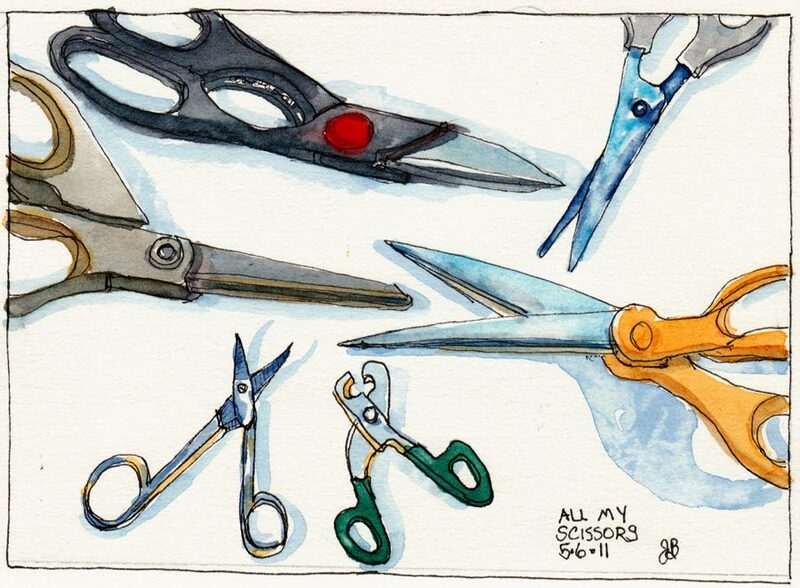 All The Scissors I Own, EDM#105, ink & watercolor, 5.5x7.5"
I’ve long enjoyed just starting somewhere on the page and letting the details and story expose themselves in my sketch as my eyes explore the subject. I like the “just see what happens” approach. That is a lot of fun. But it doesn’t work well when I’m trying to fit a scene onto a page, or realistically capture a place or people or both. That requires some comparing, measuring, careful checking of angles, drawing imaginary (or penciled) “plumb lines” to see what lines up with what, noting where the top, bottom, sides and midlines are in the subject vertically and horizontally, and marking those same spots on the page so that it all fits. And of course there are lots more…perspective, line quality, etc. I just wasn’t willing to do most of that before, but now I am. Even more surprising than my willingness is how enjoyable it is and how it’s starting to become second nature. I don’t want my drawing to be pefect—I love imperfect wonky drawings—they’re so much more interesting and lively than perfectly realistic ones. I just want the darn picture to fit on the page and the proportions to be at least almost right, and to be able to draw more quickly and accurately when I need to. These drawings are wonderful. You draw more than anyone I know. I keep meaning to, and rarely do. Tell me about this Every Day in May thing. Great compositions Jana. Love your watercolors – as always an inspiration for me. Great drawings. Good luck with the accuracy and fittingontopageness. These are charming sketches, Jana. I am slowly coming around to the idea that”wonky” sketches that result from direct observation have more personality and appeal than technically “perfect” drawings. Being something of a perfectionist, it has been a struggle to get there. As always, your dedication and constant emphasis on practice and improvement is inspiring. Happy Mothers Day to you. These drawings are wonderful. And I completely agree about wonky drawings, but I would caution you that there are “realistic” paintings and drawings that are very wonky, but they are also so persuasive about their realism that we can tend to ignore the wonkiness even as the wonkiness is there adding what wonkiness adds — that sense of life and individual perception. The elongations of Ingres people is one famous example of how something that seems realistic really isn’t — but there’s gazillions of famous works that seem real and are very imperfect in this way that you rightly praise. 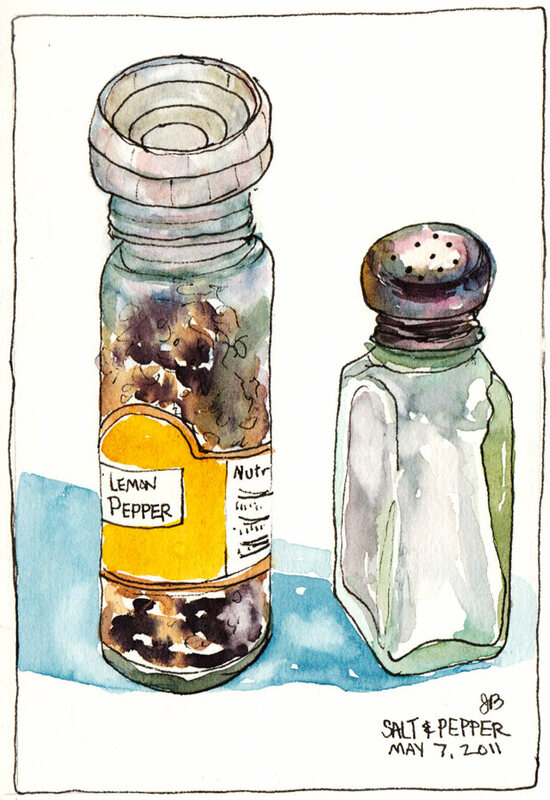 Salt and pepper up there are like individuals standing for their portraits. You seem to have caught them completely unawares! Candid views of household stuff! I love it. Jana, these are great! I love them all, they have so much character. 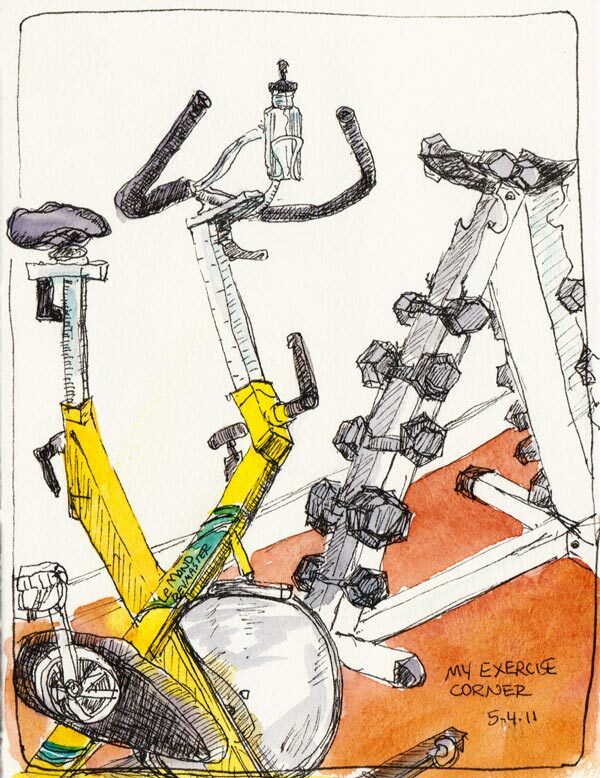 Your exercise corner drawing is the perfect balance of perfect angles and wonkiness = also just the right amount of color. I love that you are doing this project too!